Foster children aging out of Hamilton County’s child welfare system cost local residents $17.7 million in social expenses and lost productivity each year, according to a local financial impact study by the University of Cincinnati’s Economic Center and Hamilton County Job and Family Services. 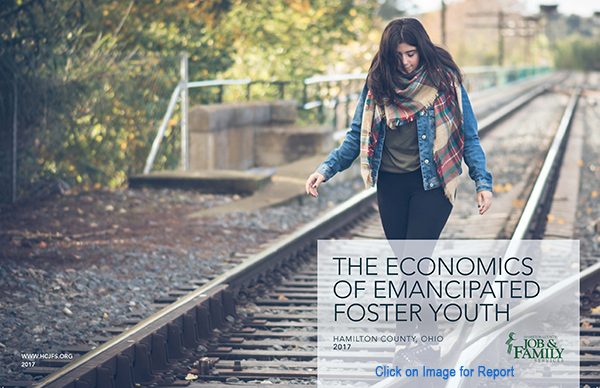 The study is the first comprehensive local look at the financial impact of children who emancipate – aging out of the system between age 18 and 21 without a permanent situation with a dedicated, caring adult. The good news: community interventions can have a positive impact on those costs, including a promising local mentoring program that has a powerful return for foster youth. Click here for the full report and see below for other details.